Hearing loss is any degree of impairment of the ability to apprehend sound. Sound can be measured accurately. The term decibel (dB) is a measure of loudness and refers to a unit for expressing the relative intensity of sound on a scale from zero, for a nearly imperceptible sound, to 130, which is the level at which sound causes pain in the average person. A drop of more than 10 dB in the level of sound a person can hear is significant. Sound travels as waves through a medium like air or water. These waves are collected by the external ear and cause the tympanic membrane (eardrum) to vibrate. 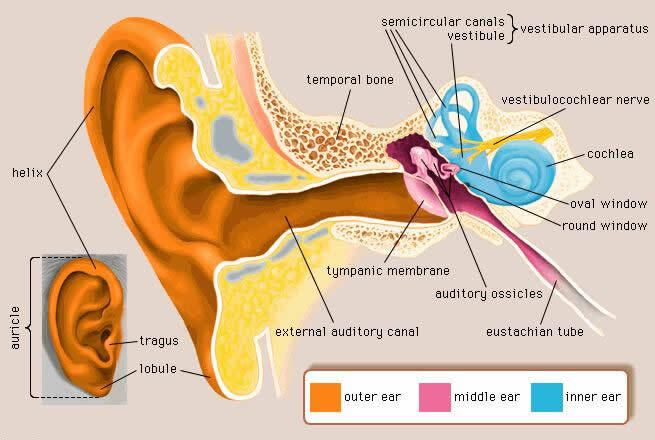 The chain of ossicles (tiny bones) connected to the eardrum—the incus, malleus, and stapes—carries the vibration to the oval window (an opening to the inner ear), increasing its amplitude 20 times on the way. There, the energy causes a standing wave in the watery liquid (endolymph) inside the organ of Corti. (A standing wave is one that does not move.) The frequency of the sound determines the configuration of the standing wave. Many thousands of tiny nerve fibers detect the highs and lows of the standing wave and transmit their findings to the brain, which interprets the signals as sound. Hearing can be interrupted in a variety of ways at each of the five steps. The external ear canal can be blocked with ear wax, foreign objects, infection, and tumors. Overgrowth of the bone can also narrow the passageway, making blockage and infection more likely. This condition can occur when the ear canal has been flushed with cold water repeatedly for years, as is the case with surfers, for whom the condition called “surfer’s ear” is named. The eardrum is so thin a physician can see through it into the middle ear. It can be ruptured by sharp objects, pressure from an infection in the middle ear, or even a firm cuffing or slapping of the ear. The eardrum is also susceptible to pressure changes during scuba diving. Several conditions can diminish the mobility of the small bones (ossicles) in the middle ear. Otitis media, an infection in the middle ear, occurs when fluid cannot escape into the throat because the eustachian tube is blocked. The fluid (pus or mucus) that accumulates prevents the ossicles from moving as efficiently as they normally do, thus dampening the sound waves. In a disease called otosclerosis, spongy tissue grows around the bones of the inner ear. This growth sometimes binds the stapes in the oval window, which interferes with its normal vibration and causes deafness. All the conditions mentioned so far—those that occur in the external and middle ear— are causes of what is known as conductive hearing loss. The second category, sensory hearing loss, refers to damage to the organ of Corti and the acoustic nerve. Prolonged exposure to loud noise is the leading cause of sensory hearing loss. A million people have this condition, many identified during the military draft and rejected as being unfit for duty. The cause is often believed to be prolonged exposure to rock music. Occupational noise exposure is the other leading cause of noise-induced hearing loss (NIHL) and is ample reason for wearing ear protection on the job. More unusual, but often undetected, is low-frequency hearing loss. Scientists discovered in 2001 that people with a particular gene mutation gradually lose their abilities to hear low-frequency sounds. 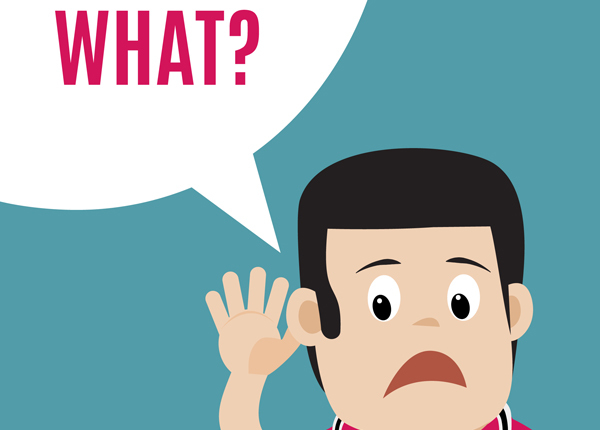 Since those people with this type of hearing loss can still distinguish speech, they often remain unaware of the low-frequency changes in their hearing. The scientists believe that the same gene mutations might make some people more susceptible to high-frequency hearing loss, but further study is needed. One-third of people older than 65 have presbycusis, which is sensory hearing loss due to aging. Both NIHL and presbycusis are primarily loss of the ability to hear high-frequency sounds. In speech, consonants generally have a higher frequency than vowels. Yet in most languages, consonants provide us the clues needed for determining what a person is saying. So these people hear plenty of noise, they just cannot easily make out what it means. They have particular trouble differentiating speech from background noise. Brain infections such as meningitis, drugs such as the aminoglycoside antibiotics (streptomycin, gentamycin, kanamycin, tobramycin), and Meniere’s disease can also cause permanent sensory hearing loss. Meniere’s disease combines attacks of hearing loss with attacks of vertigo. The symptoms may occur together or separately. High doses of salicylates such as aspirin and quinine can cause a temporary high-frequency loss, and prolonged high doses can lead to permanent deafness. There is also a hereditary form of sensory deafness and a congenital form most often caused by rubella (German measles). Sudden hearing loss of at least 30 dB in less than three days is most commonly caused by cochleitis, a mysterious viral infection. The final category of hearing loss is neural hearing loss. Permanent neural hearing loss most often results from damage to the acoustic nerve and the parts of the brain that control hearing. Strokes, multiple sclerosis, and acoustic neuromas are all possible causes of neural hearing loss. Hearing can also be diminished by tinnitus, which is characterized by extra sounds generated by the ear. These sounds are referred to as tinnitus, and can be ringing, blowing, clicking, or anything else that no one but the patient hears. Tinnitus may be caused by loud noises, medication, allergies, or medical conditions—from the same kinds of disorders that can cause diminished hearing. 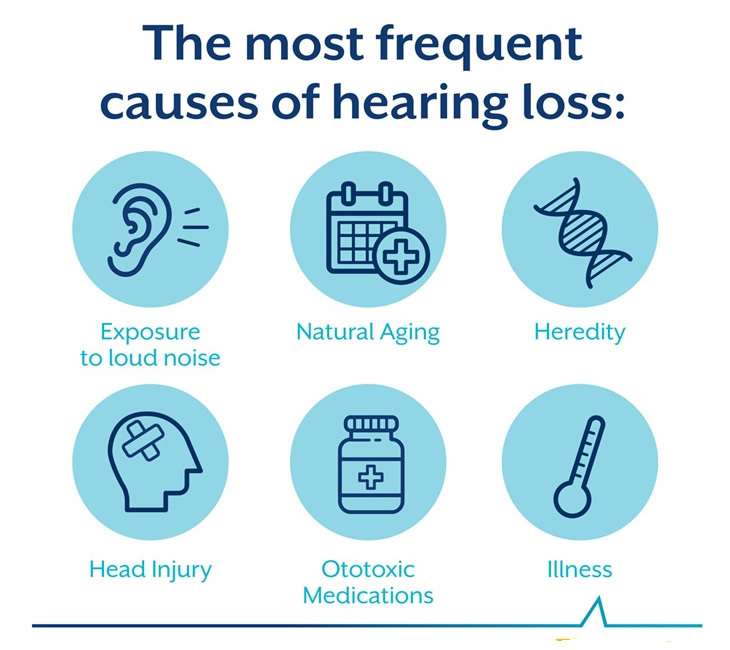 Many common causes of hearing loss can be detected through an examination of the ears and nose combined with simple hearing tests performed in the physician’s office. An audiogram (a test of hearing at a range of sound frequencies) often concludes the evaluation. These simple tests often produce a diagnosis. If the defect is in the brain or the acoustic nerve, further neurological testing and imaging will be required. The audiogram has many uses in diagnosing hearing deficits. The pattern of hearing loss across the audible frequencies gives clues to the cause. Several alterations in the testing procedure can give additional information. For example, speech is perceived differently than pure tones. Adequate perception of sound combined with inability to recognize words points to a brain problem rather than a sensory or conductive deficit. Loudness perception is distorted by disease in certain areas but not in others. Acoustic neuromas often distort the perception of loudness. Alleviate accumulated wax in the ear by taking oral supplements with essential fatty acids such as flax oil and omega-3 oil. Identify and avoid potential allergenic foods. Children who are allergic to foods have an increased risk of getting chronic ear infections. Take nutritional supplements. B-complex vitamins and iron supplements may be helpful in preventing protein deficiency and anemia. These conditions depress immune function and increase the risk of chronic ear infections. Children suffering from frequent ear infections may need supplementation with strong antioxidants such as vitamins A and C, zinc, and bioflavonoids. High-potency multivitamin and mineral supplements should contain most of these helpful nutrients as well as other essential vitamins and minerals. Ginkgo biloba. Ginkgo may be effective in patients with hearing loss who often complain of ringing in the ears. Natural antibiotics such as echinacea and goldenseal can help prevent or treat ear infections. Certain Chinese herbal combinations can help alleviate tinnitus, ear infections, and chronic sinus infections that can lead to hearing loss. Homeopathic therapies may help patients who have sensory hearing loss. An experienced homeopathic physician will prescribe specific remedies based on knowledge of the underlying cause. Acupuncture may be able to improve hearing in some patients with sensory-neural deafness. It may be used to improve the circulation of fluids in the head that lead to chronic congestion and noises. Other therapies that may help improve hearing in some patients include Ayurvedic medicine, craniosacral therapy, and auditory integration training. Conductive hearing loss can almost always be restored to some degree, if not completely. Matter in the ear canal can easily be removed, with a dramatic improvement in hearing. Surfer’s ear gradually regresses if the patient avoids cold water or uses a special ear plug. In advanced cases, surgeons can grind away the excess bone. A middle-ear infection involving fluid is also simple to treat. If medications do not work, fluid may be surgically drained through the eardrum, which heals completely after treatment. Traumatically damaged eardrums can be repaired with a tiny skin graft. Otosclerosis may be surgically repaired through an operating microscope. In this intricate procedure, tiny artificial parts are substituted for the original ossicles. Now available for complete conductive hearing loss are bone conduction hearing aids and even devices that can be surgically implanted in the cochlea. Sensory and neural hearing loss, on the other hand, cannot readily be cured. Fortunately such hearing loss is rarely complete, and hearing aids can fill the deficit. In the ear hearing aids can boost the volume of sound by up to 70 dB. (Normal speech is about 60 dB.) Federal law now requires that aids be dispensed only by prescription. Tinnitus can sometimes be relieved by adding white noise (such as the sound of wind or waves crashing on the shore) to the environment. Decreased hearing is such a common problem that there are legions of organizations to provide assistance. Special language training, both in lip reading and signing, is available in most regions of the United States, as well as special schools and camps for children. Prompt treatment and attentive follow-up of middleear infections in children will prevent this cause of conductive hearing loss. Sensory hearing loss as a complication of epidemic disease has been greatly reduced by control of infectious childhood diseases, such as measles. Laws that require protection from loud noise in the workplace have substantially reduced incidences of noise-induced hearing loss. Surfers, cold-water fishermen, and other people who are regularly exposed to frigid water should use the right kind of ear plugs.